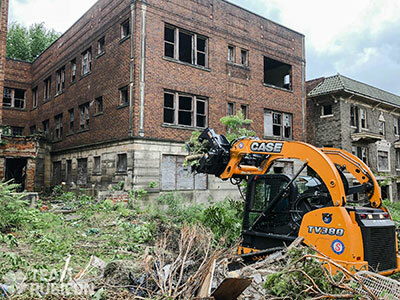 Case Construction Equipment and heavy equipment dealer Southeastern Equipment donated the use of compact track loaders and excavators for blight removal in East Cleveland, Ohio, as part of Operation Ray Chapman, a Team Rubicon initiative. “The Beast,” a specially outfitted Case SV340 skid-steer, was also deployed on the operation with a forestry mulching head to assist in removing years of overgrown brush. Equipment for the operation was supported out of Southeastern’s Brunswick and Mentor, Ohio, locations. Case reps, 20 Team Rubicon volunteers and numerous local residents—all with the goal of reclaiming abandoned blocks from overgrowth and decay with an eye toward future development—supported the operation. The Davey Tree Expert Co. ranked as the 12th largest employee-owned company in the U.S., according to the National Center for Employee Ownership (NCEO). The list shows Davey’s growth as the company moved from the 13th largest company in 2017 to the 12th largest in 2018. The NCEO’s 2018 Employee Ownership 100 list includes the nation’s largest companies that are majority owned by an employee stock ownership plan or other broad-based employee ownership plan. Davey, which employs more than 9,500 people, has been employee-owned since 1979 when employees successfully bought the company from the family of its founder, John Davey. One hundred employees from Ruppert Landscape’s Lilburn and Mableton, Ga., and Raleigh and Charlotte, N.C., branches worked together with parishioners to transform the grounds of Corpus Christi Catholic Church in Stone Mountain, Ga., on Sept. 13. The renovation took place as part of Ruppert’s annual “Field Day” event, which enables the company and its employees to give back to the community, combining charitable giving, training and friendly competition amongst branches. Team members competed in a variety of events, some fun in nature, like tug-of-war and dodgeball; others testing their knowledge and skills, like field efficiency and clean truck contests; and others that will have a direct, long-lasting and high-quality benefit for the church. “When we began looking at potential sites to hold our next Field Day, we looked for a site where there was great need and where what we did would provide great benefit,” said Craig Ruppert, Ruppert Landscape CEO. “We felt that it was important, now more than ever, to support our country’s immigrants, and we are happy to be using our landscaping skills to benefit an organization that serves such a diverse community.” About 70 percent of Corpus Christi’s congregation is comprised of immigrants and refugees from 47 different countries who speak more than 14 different languages. The day involved a significant investment of both time and materials, totaling approximately $100,000. Site improvements included planting more than 600 shrubs and perennials and 12 shade and ornamental trees, laying 18,000 square feet of turf, improving drainage with 1,000 linear feet of new drain pipe, installing 1,000 square feet of concrete, laying 120 yards of mulch and weeding, pruning and mowing existing landscaping on the 7-acre site. In total, more than 800 man-hours were donated to bring this project to fruition. Ziehler Lawn and Tree Care launched the Front Porch Food Pickup program, an initiative aimed at collecting and donating nonperishable food goods to those in need across its operational communities. To ensure the success of the food campaign, the company, which specializes in lawn service in Dayton, Ohio, has incorporated all members of the team, including technicians, solutions specialists, customer experience specialists, managers and customers. Customers seeking to be a part of the food campaign are asked to place food items such as peanut butter, jelly, sauces (like tomato or spaghetti), soups, canned vegetables, canned fruits, breakfast bars, nuts, beans and other nonperishable food items in crates on the passenger side floorboard for collections ahead of their lawn care appointments. All collections will end on the Friday before Thanksgiving and resume the following season, starting in March.